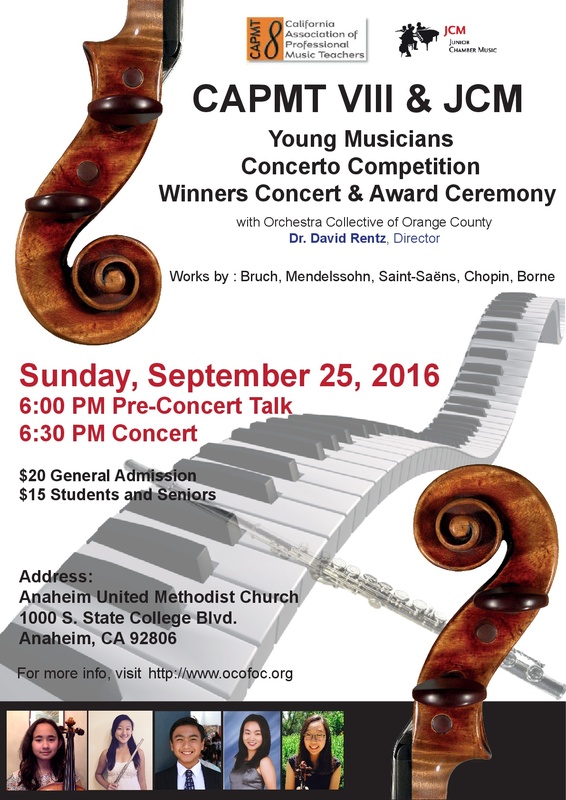 Congratulations to the 2016 concerto competition winners! Ryan Choi (cello) has studied the cello for nine years and currently studies with John Walz. He began his cello studies in the third grade and has been playing ever since. Within the past few months, Ryan has also been selected as principal cellist of the Southern California School Band and Orchestra Association’s (SCSBOA) High School Honor Orchestra and has placed first in the Junior Bach Festival. He plans to incorporate his passion for music when he attends university. 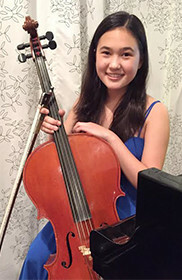 Anna Fruman (cello), 13, currently attends the Orange County School of the Arts. She is a member of the Pacific Symphony Santiago Strings and the OCSA Symphony Orchestra. Anna has been part of Junior Chamber Music for three years. Anna currently studies with Professor Joon Sung Jun. 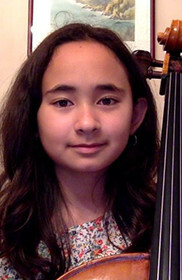 Sarah Kave (cello) is 11 years old, began studying cello at the age of 5 with Rachel Lonergan and is currently studying with Andrew Cook. Sarah has been with the CSUN Youth Orchestra (CSUNYO) for 6 years and is the principal cellist of the Philharmonic. 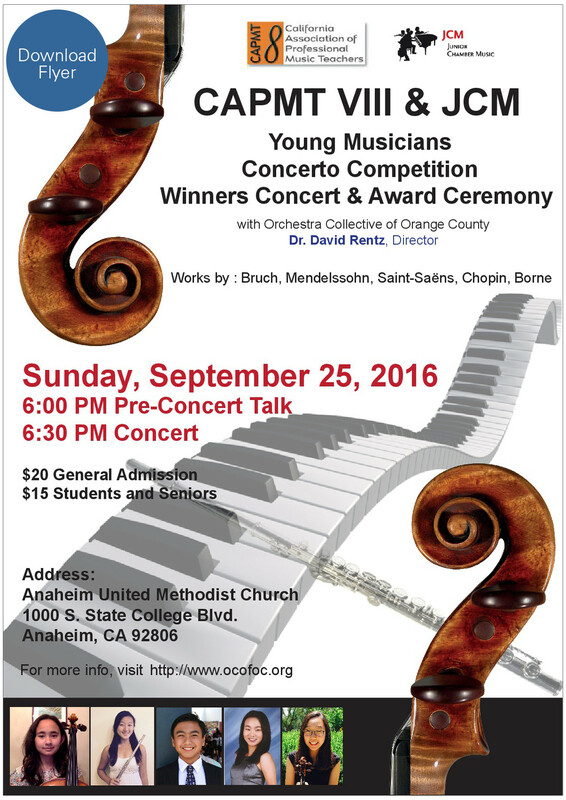 She won numerous competitions; the V.O.C.E State (3rd), Liana Cohen Open Festival (1st), the Grand Prize in Satori Strings, and is a winner of the CSUNYO Concerto Competition. Her JCM piano trio did a master class with Robert DeMaine, the LA Philharmonic'd principal cellist. Recently, she has played at the Israeli American Council, the Walt Disney BP Hall for the Motif Awards, Youtube Space LA, Zipper Hall, the Temple of The Arts, and with her twin brother, she played at Temple Kol Tikvah for years. Sarah just had her first solo debut with the CSUNYO Philharmonic. She is a recipient of the CSUN, David Weiss, and the LACESM Scholarships. In her spare time, she enjoys reading, writing, singing, and acting. When she grows up, she wants to become a well respected cellist. Stephen Kelman (piano), 13, began playing piano at 5. He is an 8th grade student at McAuliffe Middle School in Los Alamitos and he will be attending Los Alamitos High School in the fall. He is currently studying with Craig Richey. 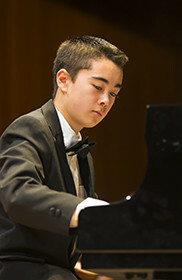 Stephen was the piano soloist in concert with Musique Sur La Mer Youth Orchestra performed at Walt Disney Concert Hall and Sydney Opera House. In recent years, Stephen won several awards in different competitions: 2nd place in SYMF Young Pianist Concerto Competition; 2nd place at the CAPMT Contemporary Piano Competition, etc.. In addition to performing classical music, Stephen performed with the award winning McAuliffe Middle School Jazz Band and combo under the direction of Mr. Chuck Wackerman. He was also chosen to perform with SCSBOA Middle School Honor Jazz Band. He enjoys making music with his JCM chamber group and music composition/improvision. Stephen loves sharing his music with others and serves as a volunteer youth musician for St Hedwig Catholic Church, Good Shepherd Presbyterian Church and several senior living centers. He was awarded the community service medal for his many volunteer efforts. Besides playing piano, Stephen enjoys playing soccer and traveling with his family. 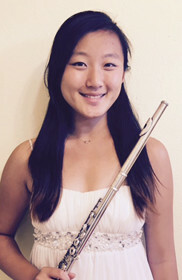 Jennifer No (flute),16, is a sophomore at West Ranch High School. Music started becoming a part of her life when she started playing the piano at age 5. After she became more exposed to music and fell in love with it through the years, she began playing the flute at age 9 under Jennifer Lee. During her early years, she participated in many of her local music programs, such as her school band, District Honor Band, and the California All-State Symphonic Band. Through these activities, she was able to perform both as a soloist and the principal chair, and was able to receive a musical scholarship. She also participated in the Southwestern Youth Music Festival and received 1st in 2011. After these experiences, she joined organizations and groups such as Junior Chamber Music and the CSUN Youth Philharmonic which helped her expand her musical knowledge even more. Through JCM, Jennifer was able to receive 3rd place in the VOCE State Final in 2015 and was able to attend the Montecito International Music Festival with a scholarship. More recently, Jennifer performed with the Santa Clarita Philharmonic as the winner of the 2015 Santa Clarita Concerto Competition. She has also won 1st in the 2016 CAPMT Regional Concerto Competition for her division and will compete at the in the CAPMT State Concerto Competition in the near future . She also received a full scholarship to the Idyllwild Summer High School Chamber Festival. Outside of music, Jennifer enjoys watching movies with her friends and playing tennis with her school tennis team.